Sunday School teachers are flocking to SharefaithKids Sunday School curriculum for its content, simplicity, focus and price. A Sunday School Curriculum Like No Other! Sharefaith, award-winning creator of all-in-one church resources such as church websites, mobile apps, Sunday School Curriculum , the largest worship graphics library, and church giving and donations platforms, announced the launch of its new Kids Curriculum, SharefaithKids V2. Regardless of how relevant you try to make Biblical content for kids, Sunday School is the one place where the gap between teacher, parent and child is growing bigger and bigger. Curriculum content creators focus much of their efforts in adopting a school-like format, while missing the focus on Sunday School all together - which is training the child in the knowledge and love of the Bible. In surveying thousands of churches, Sharefaith found that the major concern of Sunday School teachers and directors were the complexity of content preparation, volunteer training and the ever decreasing focus on true Gospel outreach. Teachers are frustrated with bulk-content approach of current curriculum providers which requires hours of preparation and input, often resulting in the Sunday School department creating their own curriculum. Those days are a thing of the past, with SharefaithKids Sunday School resources V2. “Our approach started with the Gospel. The Bible is filled with adventure, but more so, it functions as the compass of our entire Christian life. We want to create content that not only expands each child’s love for the Bible, but also provide teachers with the easiest way to prepare, train and teach Sunday School.” says Willem van Wyk, CEO/President of Sharefaith. Since its inception 1 year ago, 12,000 teachers from all denominations have flocked to this Gospel-centered, teacher-friendly Sunday school curriculum and their kids are loving it. The best part of SharefaithKids is that it’s cloud-based as well as offline. The cloud-based approach makes it possible for a teacher to prepare and teach using their Mobile Phone, Tablet and Computer anywhere, at any time. The offline mode is for those with weak internet connections. They can still tap into all the resources, without the hassle of low bandwidth or network interruptions. Sharefaith Kids is available as a stand-alone membership from Sharefaith ($41/m) or as part of the Complete Membership ($71/m) which offers churches their entire media and outreach bundle that includes Sunday School, a church website, a church mobile app, a tithing/donations platform, 75,000 HD, 4K, and SD graphics, as well as integrated presentation software. 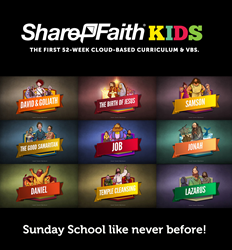 You can try Sharefaith Kids Sunday School curriculum resources today, which includes 3 full free lessons! Visit Sharefaith.com for more information.